This article was first published in ArabNet. In the Middle East, opportunities for innovation in payments are plentiful. 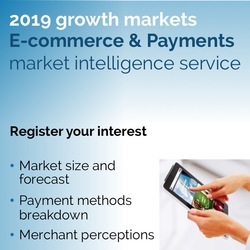 More than 80% of brick-and-mortar retail payments and 65% of e-commerce payments are still made in cash, and smartphone adoption exceeds 100% in several countries, according to research and advisory firm Global Growth Markets. Pairing those facts with the socioeconomic and demographic realities of the region – household incomes above the global average and the share of young people the highest on the globe – suggests all the makings of an ideal environment for safe, secure and convenient alternative payments. Statistics from Global Growth Markets back up this suggestion. 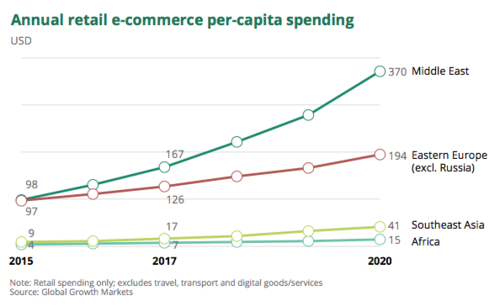 Online retail spending per person in the Middle East reached USD167 in 2017, higher than Eastern Europe, Southeast Asia and Africa. And despite spending already being the highest among those regions, it is also projected to be one of the fastest growing over the next few years, at 30% annually. This compares with 34% in Southeast Asia, but note that per-capita spending in the Middle East will still be nine times that of Southeast Asia in 2020. So, with the foundation for growth in place, what considerations should companies already in the market be conscious of, and how should regional market factors be taken into consideration by new market entrants? The Middle East is not the first region where the ability to scale online and offline business has been stifled by the persistence of cash payments. Research by Global Growth Markets on payment markets around the world found both carrots and sticks being used to drive users away from cash and towards new and more cost-effective payment methods. In Southeast Asia, e-commerce site Lazada.com, owned by Chinese Internet giant Alibaba, partnered with local 7-Eleven stores, allowing them to receive deliveries and accept payments for online purchases. The partnership reduced costly repeat delivery, simplified delivery locations, and in some cases required customers to pay using a non-cash method. 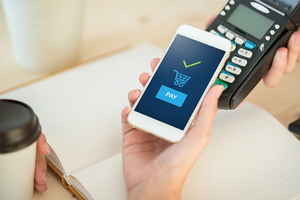 The Middle East presents a rare opportunity for digital payment innovators to access a populous and high-spending region with good levels of connectivity. While there are few trends that are consistent across all the countries in the region, it is nearly universal that the share of credit card, debit card and digital payment methods is increasing. With the foundations in place, innovators are sure to challenge established business models with growing frequency, and consumers will gradually become increasingly accustomed to new payment methods and platforms. GGM can help with international e-commerce, payments, financial services and retail strategic advisory, market intelligence and M&A/partnering - in Asia, the Middle East, Africa and other growth markets. Contact us to find out more.